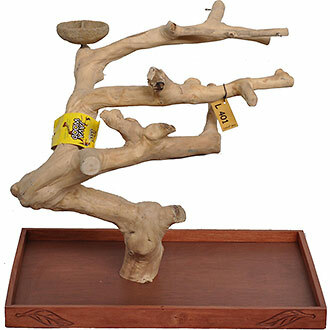 Java wood is one of the most common wood types you will find being sold as perches and natural stands for parrots. It’s a quality, safe wood for birds and comes in some very interesting twisted shapes which makes it ideal to use as an enriching natural wood branch perch. Java is also commonly used to make parrot stands, which are fantastic to have in play areas, enclosed or screened in balconies, or just anywhere your parrot is hanging out with his or her human family! There are stands out there which use plastic, PVC piping and other unnatural perches and bits and pieces. These offer nothing to parrots in the way of health, foot support, and enrichment. Only natural wood branches give birds the chance to experience something of what they would in the wild and provide the much needed variable surface texture, width and shape for keeping their sensitive feet healthy. And if you don’t have the time or materials to put together your own perches and stands, there are now more and more options out there to buy them pre-made and ready to use. 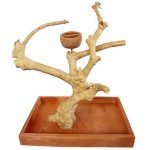 All of the java wood perches and stands for parrots here (and throughout this entire website) are natural, non-toxic, untreated and are healthy and fun for parrots! Remember: Every natural stand and perch is unique as they come from real trees. No two will look the same. Both types gives you lots of flexibility in where to put the stand and make it easy to move them around when you need to. This is a solid piece of wood. A miniature java tree, securely attached to a wooden base and fitted with wheels so it can be quickly and easily moved around the room without the need to lift it up. It weighs about 77 pounds (35kg) so you’ll certainly appreciate being able to wheel it around. The weight and sturdy design means that this stand is as solid as a rock and has no risk of toppling over. 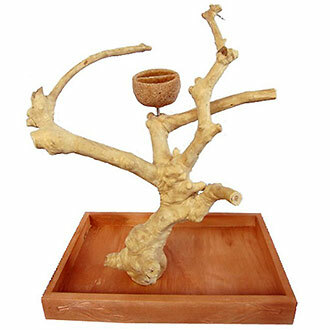 It also comes fitted with a unique stone bowl that can be used for treats or foot toys. 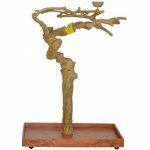 This is a tall wood tree stand, standing at about 5’3″ and with a base width of about 48″. It will take up a corner of a room, or be a centerpiece in an enclosed space where your parrot is free to roam. 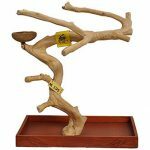 This is a brilliant perch and play stand and is one of those products that provides long term enrichment, because it’s made so solidly and to such a high standard. This excellent video from Diane Burroughs gives you an up close look at one of these Java bird stands, featuring an African Grey. Check it out! These table top playstands are similar to the ones on casters, but are a smaller size, lighter and as a result, more mobile. You could have one set up on a bench, or multiple stands spread out for your bird to safely fly to and from. Weighing between 10 and 20 pounds depending which size you get, they’re still certainly very sturdy and solid. But light enough that you’ll be able to move them from tables to desks to benches, or anywhere else you want to have them set up for your bird to freely fly to, climb around on and perch on while watching the world go by. While the base serves as a “poop catcher”, lining the bottom with newspaper is something people often choose to do just for ease of cleaning, increased hygiene and convenience. There’s a bowl included and although there’s nowhere to hang toys, you can easily add some stainless steel hooks and add some bird safe toys to the stand to jazz it up and add even more interest for a parrot.